Paulie is a 1998 American adventure fantasy comedy film about a disobedient bird named Paulie, starring Tony Shalhoub, Cheech Marin, Gena Rowlands, Hallie Eisenberg, and Jay Mohr. Mohr performs both the voice of Paulie and the on-screen supporting role of Benny, a character who has a lot of dialogue with Paulie. The film is a picaresque tale about an intelligent talking blue-crowned conure named Paulie (voice of Jay Mohr), and his long quest to return to his owner. Misha Vilyenkov (Tony Shalhoub), a Russian immigrant and former teacher of literature, lives in America and works as a janitor at an animal testing lab. At the lab, Misha encounters Paulie and is shocked to see Paulie speaking fluent English. Subsequently, Paulie does not speak a word when Misha brings others to witness the talking bird. Misha woos Paulie to tell his story by offering him pieces of mango. Paulie tells Misha about his original owner, a little girl named Marie (Hallie Eisenberg) who suffers from a severe stutter. The story transitions to a flashback scene in which Paulie is a baby bird. As Marie learns to speak properly, so does Paulie, beginning with understanding the meaning of words and progressing to the construction of complex sentences. Marie's father Warren (Matt Craven), a soldier, returns home from Vietnam and decides that Paulie is not helping Marie. The father's resentment of the close bond between Paulie and Marie, and their shared progress in speech development, is evident. It becomes obvious that he wants Marie to forget Paulie, when the father brings her a cat. The cat and Paulie do not get along. Once again, Warren blames Paulie for Marie's speaking problems and believes she has imagined Paulie's ability to speak. Eventually after a dramatic event in which Marie falls off the roof in an attempt to teach Paulie to fly, Warren convinces Marie's mother Lila (Laura Harrington) to send him away. Paulie is passed from one owner to another, eventually ending up in a pawn shop, where he spends his time insulting the customers. One day a shady customer named Benny (Jay Mohr) shows interest in buying Paulie, thinking he could profit from the bird's ability to talk. Before he can act, however, a widowed artist named Ivy (Gena Rowlands) purchases him with the intent of reforming his rude personality. She befriends the bird and agrees to help him find Marie who has moved across the country to Los Angeles. They begin traveling using her mobile home but when Ivy loses her sight in the middle of their trip, Paulie decides to stay and take care of her. After Ivy dies, Paulie, having finally learned to fly, continues his journey. 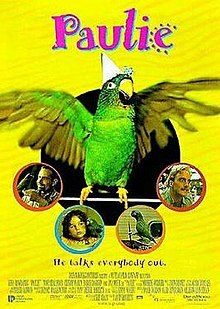 In East Los Angeles, Paulie joins a group of performing conures owned by migrant musician Ignacio (Cheech Marin), temporarily forgetting about Marie as he develops feelings for a female conure named Lupe. At one of his performances, Benny, having also moved to L.A. recognizes Paulie and attempts to purchase him from Ignacio. When Ignacio refuses his offer, Benny makes a phoney police call at one of his performances. As the police show up, Benny kidnaps Paulie amidst all the chaos and Ignacio is arrested and presumably deported. Under Benny's influence, Paulie begins a life of crime. In a botched jewel theft, Paulie flies down through the chimney of a house, where he is trapped inside, then abandoned. Paulie is then brought to the institute, his current home, where employees and scientists are stunned by his intelligence. They subject him to testing, and promise that he will be reunited with Marie. When Paulie discovers that he has been lied to by way of his acquisition as institute property, he refuses to cooperate with any more tests, humiliating Dr. Reingold (Bruce Davison), the head of the institute, in front of his scientific peers by acting like an ordinary parrot. As a result, his wings are clipped, and he is eventually imprisoned in the basement when he starts biting the researchers. Moved by Paulie's story, Misha decides to give up his menial job to release Paulie and take him to Marie. After escaping from the institute and taking a bus to her address, they find her, now a full grown, beautiful young woman (Trini Alvarado) unrecognizable to Paulie, who believed Marie was her little friend. After a moment of confusion, Paulie and Marie are happily reunited as Marie sings Paulie's favorite song and he remembers her. The film ends with the three characters happily entering the house. Directed by John Roberts and written by Laurie Craig, the film's production budget was $23 million. The movie Paulie scored a 62% "Fresh" rating at Rotten Tomatoes. It was distributed in 24 countries and 10 different languages between 1998 and 1999. Box office receipts grossed $5,369,800 on the opening weekend, and $26,875,268 total. It was released in 1,812 North American theaters. ^ "Box Office Mojo". IMDB.com. 2015. Retrieved 2015-04-23. ^ "Paulie (1998)". imdb.com. imdb.com. 2015. Retrieved 15 May 2015. ^ a b "PAULIE". Box Office Mojo. Retrieved 2009-04-11. ^ "Paulie (1998)". Rotten Tomatoes. Flixster, Inc. 2015. Retrieved 15 May 2015. ^ "Angels Stays Aloft in Top Spot". Los Angeles Times. Retrieved 2012-07-08. This page was last edited on 23 January 2019, at 11:18 (UTC).